Retail branches and call centers can be - and should be - the ultimate incubators of Emotional Intelligence. Retail Banking and Call Center professionals can be asked to handle an enormous number of unique customer interactions in a single day. Some of these interactions are positive and advise-based conversations with happy customers, while others can be high stress, problem solving and complaint resolution in nature. Regardless of the situation the best-of-the-best have the ability to bring about a positive result for each and every client. 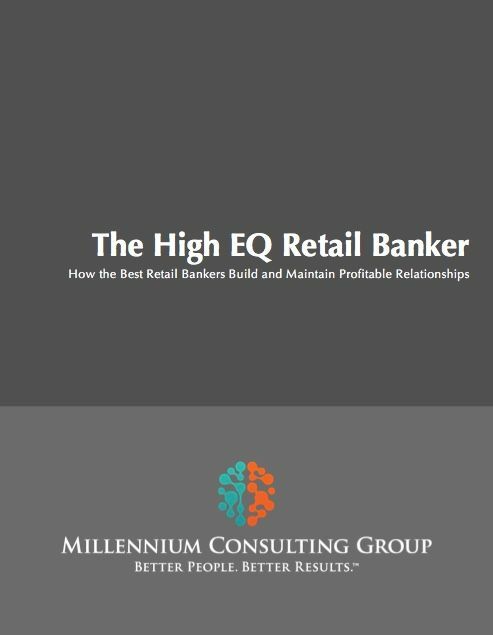 The High EQ Retail Banker is a master at creating an empathetic, solution oriented and high value customer experience for each and every client. And... they do this all in a extremely time constrained, high volume, high pressure environment. Our High EQ Retail Banker workshop is designed to immediately and positively impact participant EQ levels by working with them to understand and develop the personal development and relationship development mindsets and skill sets of the most successful bankers in the industry. This fast paced, highly practical and highly interactive program takes the EQ discussion beyond general theory by delivering industry specific functional best-practices that will challenge participants to elevate the quality of their personal growth and relationship development efforts.